When Sunil Gavaskar retired at the age of 38, people asked the reason for his retirement. He said that it was better to call it quits at an age when people are asking why he was retiring, rather than why not. 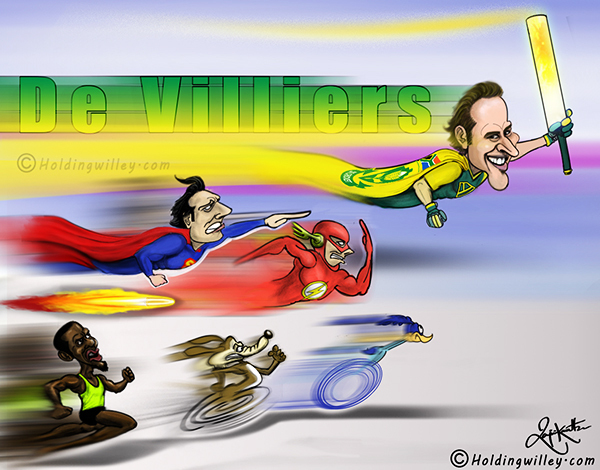 AB de Villiers’ decision to retire from all international cricket comes as a shock, as he was still scoring runs prolifically and his fielding was at its best. These days, a lot of cricketers quit international cricket to spend more time with their family and ply their trade in T20 franchise cricket. AB was more than just a prolific run scorer. He had a dazzling array of shots in his repertoire and his strokes singed all most all blades of grass on the ground. He was known as a 360 - degree player who had shots all around the dial. AB was also an entertainer par excellence and extremely popular, even among rival fans. Here are some statistical tidbits from his career across all 3 international formats. 57.41 - AB was an extremely good wicketkeeper before he gave it up due to back problems and his huge workload. He scored 2,067 runs in 24 Tests at an average of 57.41 which is the highest among the 30 wicketkeepers who have scored a minimum of 2,000 runs in Tests. 78 - AB played 78 innings before scoring his first duck in Tests. This period was from 17th December 2004 till 26th Nov 2008. This is still a world record. 98 - AB played 98 consecutive Tests since debut for South Africa before missing one due to the birth of his child. This was a world record until it was broken by Brendon McCullum, who played 101 consecutive Tests. 100 and 10 dismissals as keeper - AB is the only player in Test history to score a century and effect 10 plus dismissals in the same Test. He did it against Pakistan at Johannesburg in February 2013. 62.41 - There have been 19 batsmen who have scored a minimum of 2,500 runs batting at the number 5 position in Tests. AB’s average of 62.41 is the highest in this position. 78 - AB has played the most T20Is for South Africa. 1,672 - He has scored the 2nd highest number of runs for South Africa in T20Is. 44 - He has taken the most catches as a fielder for South Africa in T20Is. 6,649 - He has scored the most runs by a South African in Twenty20 cricket. 251 - He has played the 3rd most matches by a South African in Twenty20 cricket after Albie Morkel and David Miller. 9,577/ 9,427 – AB has scored 9,577 runs in ODIs out of which 9,427 runs are for South Africa. This is the 2nd highest by a South African in ODIs after Jacques Kallis, who has scored 11,550 runs for South Africa. 25 – AB’s 25 centuries in ODIs is the 2nd most by a South African after Hashim Amla, who has scored 26. 101.09 - There have been 19 batsmen who have scored a minimum of 9,000 ODI runs. AB has the highest strike rate among them with 101.09. 16/31 - During the course of his innings of 149 in 44 balls against West Indies at Johannesburg in 2015, AB scored the fastest fifty in ODIs: off just 16 balls. In the same innings, he scored the fastest century: in just 31 balls. 150/64 - AB also holds the record for the fastest 150, off 64 balls, when he scored an unbeaten 162 off 66 balls against West Indies at Sydney in the World Cup in February 2015. 204 - AB has struck 204 sixes in ODIs out of which 200 were hit while representing South Africa, which is a national record. The other 4 sixes have been while representing Africa XI. 1,000 - AB has scored more than 1,000 runs in a calendar year for South Africa 3 times in ODIs. This is also a national record. He achieved this feat in 2007, 2013 and 2015. 338.63 - During his innings of 149 off 44 balls, AB scored his runs at a strike rate of 338.63, the highest strike rate for any innings above 50 runs in ODIs. 16 - AB also holds the record for the most sixes in an innings in ODIs. He struck 16 sixes during his 149 off 44 balls against the West Indies at Johannesburg in January 2015. He jointly holds the record with Rohit Sharma and Chris Gayle. 103 - AB has led South Africa 103 times in ODIs, the 3rd most by a South African. In all, only 17 players have led their country in 100 ODIs or more. 415 - AB has played 415 matches across formats in international cricket, which is the 3rd most for a South African after Jacques Kallis and Mark Boucher. 243 - AB has taken 243 catches in international cricket, the 3rd most by a South African after Kallis and Graeme Smith. 5 - AB is one of just 5 players who have led South Africa in all 3 formats. The other 4 players are Graeme Smith, Shaun Pollock, Hashim Amla and Faf Du Plessis.